Today I came home and opened up our little guy's lunchbox to find it completely empty with the exception of a couple of apple chips that I threw in at the last minute. That just became his after school snack. No big deal. While supper's cooking, I normally gather things together and get lunch made for the next day. With some assistance from my special helper, I compiled tomorrow's lunch. 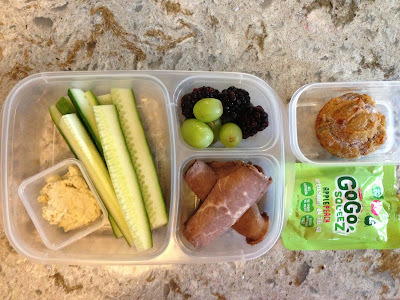 Lunch - Applegate farms roast beef, cucumber sticks, baba ganoush and grapes, blackberries and blueberries.